Moon Jae-in is attempting to mediate between Washington and Pyongyang, while his personal approval plummets at home. South Korea’s President Moon Jae-in arrived in Pyongyang on Tuesday for three days of talks with North Korea’s Chairman Kim Jong-un, with denuclearisation and the establishment of a permanent peace regime on the agenda. What is striking about this third Moon-Kim meeting is it will be the first time the leaders of both North and South Korea have had a follow-up summit. Former presidents Kim Dae-jung and Roh Moo-hyun only met with Kim Jong-il once during their terms. This indicates a high degree of commitment to dialogue from both sides. 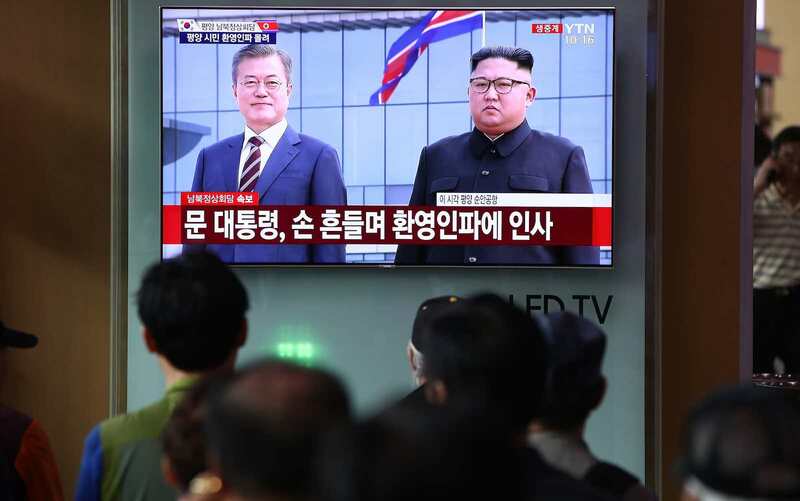 Yet the summit takes place amid various instances of policy gridlock and domestic uncertainty in the United States, South Korea, and North Korea. Both Washington and Pyongyang have failed to reach a consensus on the definition of denuclearisation, and remain stuck on the problem of sequencing – the question of whether the US should lift some of international sanctions on and improve diplomatic relations with North Korea before Pyongyang makes any verifiable and irreversible concessions. South Korea, meanwhile, is struggling with efforts to jump start joint-economic projects with North Korea due to pressure from Washington, and it is spending much effort on keeping the fragile US-North Korea détente from falling apart. Moon is also under intense domestic pressure to deliver his campaign promises as economic reforms stall, and his approval rating has continuously dropped in recent months, down from 79% in June to 49% last week. The summit takes place amid various instances of policy gridlock and domestic uncertainty in the United States, South Korea, and North Korea. North Korea seems most prepared for the summit. Pyongyang is likely to have mastered the key technicalities of missile technology and has shifted its focus from missile testing to mass production. North Korea has also adopted a “new strategic line” and is concentrating on its domestic economy instead of the nuclear program, which will allow it to reap the benefits of future inter-Korean economic projects and undermine US-led international sanctions. Kim’s decision not to display any nuclear-armed systems during the recent national anniversary parade was an illustration of North Korea’s new strategy, which is to treat its nuclear arsenal as the new normal and refrain from publicly showing off its nuclear capability. In this context, Moon’s trip to Pyongyang will seek to resolve differences and put the peace and denuclearisation process back on track. In a pre-summit meeting, Moon proclaimed that the current deadlock between Washington and Pyongyang could be resolved as long as North Korea committed to denuclearisation and the US created conditions favorable to Pyongyang’s regime security – a statement that underscored South Korea’s meditating role between the two sides. The continuity of the US-North Korea détente rests much on the assumption that Pyongyang will give up its nuclear weapons at the end of Trump’s term. Moon understands this pressure, and his national security advisor Chung Eui-yong announced that North Korea wanted to denuclearise and improve relations with the US by 2021 following a meeting last week with Kim. South Korea’s assurance will help smooth the way for a second Trump-Kim summit. Yet Moon’s agenda may be hampered by expectations for Pyongyang’s denuclearisation being too high. Finding answers to the major questions are daunting, when considering the definition, substance, and order of action for denuclearisation, and how to implement these actions in a short period of time. North Korea’s notion of concessions has constantly shifted as the process carries on. Moon has bet his political capital on the success of his North Korea policy, and the continuation of dialogue between Washington and Pyongyang. Yet at home, Moon is facing great difficulty with his income-led growth economic plans. Recent statistics indicate that his reforms have not succeeded in creating more jobs, as the number of jobs added in 2018 is much fewer than that in 2017. Moreover, an increase in minimum wage is hurting small businesses, and massive public spending on social welfare and public-sector jobs creation will increase South Korea public debt, with the pace already exceeding its GDP growth. If his North Korean policy succeeds, it will give South Korea new inter-Korean economic opportunities and boost Moon’s declining approval rating. The opening of a liaison office in Kaesong and the proposal to reopen the industrial complex there are likely to pave the way for the revival of inter-Korean economic ties. Unfortunately, the dependence of Moon’s political fortunes on improvements in inter-Korean relations will create a rift between Seoul and Washington over the long term if North Korea and the US fail to overcome the sequencing problem. Washington has continuously blocked South Korean businesses’ attempt to set up investment projects and financial transfers with North Korea, which would permit the two Koreas to engage in non-commercial and non-profit infrastructure projects such as rail and road connections. Moon can assure Kim that if he denuclearises there will be benefits from South Korean economic assistance; however, Kim has reasons to doubt any promises, since US has maintained the current sanctions regime following the April and the June summits. Should Moon not cooperate with the US sanctions in an attempt to preserve his domestic approval rating, the decision will hurt not only the alliance but also the possibility of Pyongyang giving up its weapons. Hence the gridlock, which the third Moon-Kim summit will have to overcome, or else South Korea’s meditating role will not be sustainable. It will be interesting to see how Moon’s approval rating changes after the summit, and its impact on South Korea’s choice between the United States and North Korea. The author would like to thank Dr. Viet Phuong Nguyen, Postdoctoral Research Fellow at Harvard University’s Belfer Center, for his help with the article. Engaging India means recognising vast differences between culturally diverse states and varied governance standards. Despite the urgency for peace in Afghanistan, it is important to evaluate the characteristics of the Taliban.